Earlier this year I spent several months working on a project for my adorable autistic daughter Catherine, who I hope to teach reading through a visual method. I decided to gamify this app as much as possible, as I wanted a completely immersive learning environment where she could “play to learn”. 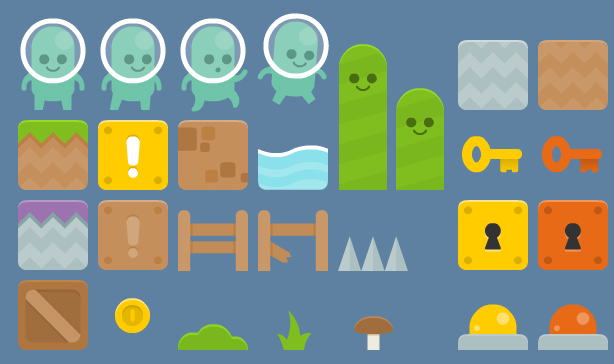 In order to try and make things as game like as possible, I used a game rendering JS library called Pixi.js, and looked for game art resources that would help keep the app as lightweight as possible, which can be really important in games, otherwise they run slow on mobile devices. It was fun to explore the game art world, and one great resource for open source and other free game art is OpenGameArt.org. It’s amazing how many kind people put up their own work so that others may benefit, often asking for nothing at all in return. There’s nothing wrong with people putting a CC 3.0 license on their work - I fully understand that people want to be at least credited. But it isn’t always easy to comply with that. What about people who’d like to print 30 t-shirts for their school? Or a sticker set using a butterfly? Under the terms of a lot of Creative Commons licenses, they can only do that if they add an attribution to the printed artwork. In many ways this protects the authors - and some of the most fantastic work we’re privileged to have in our own art database, falls under CC licenses that require attribution. But we do get excited when we see artwork that comes without these restrictions, only because it opens up different avenues for what people can do with it. Such is the case with the newly added Kenney.nl Game Art collection, which carries a CC0 (public domain dedication) license. The generosity of these developers as pretty astounding - they have thousands of graphic assets, all neatly organized, color coordinated, and packaged by theme - all ready for the aspiring developer to download and use in their game. I was lucky enough to find around 600 pieces that I thought would work will inside of Kwippe - and you’ll be able to access them all soon via a hyperlink to that collection. They were originally developed in Flash, making these asset super clean and lightweight as well. I plan to have a variety of export tools specifically for app and game developers, where they can choose their sizing, and export a zip file and hopefully a sprite sheet with all of their assets in a neat package. But definitely give Kenney.nl a visit if you’d like to explore their packs as well as their software, which looks awesome for any game dev.